Below is a video of Phoenix when he was 14 weeks old. As you can see no leash, no collar. All verbal command to use the potty pen. This article of mine has been published several times in paper magazines and countless times online. None of my dogs are potty on the grass in our yard. They solely use the pen. They can also potty on command when out in public. I came up with the potty pen idea after I started fostering dogs for a shelter. I was spending so much time cleaning up after them that I seemed to have no time for anything else. Plus I hated the way my lawn looked. I am one of those people that loves to walk on a lawn bare footed and needless to say I, and no one else wanted to. Also having small children I wanted a distinct area that I could teach my children to stay out of. "''" The pen itself can be painted or stained to match any décor or hidden with bushes or other plants. One of our puppy adopters built a absolutely stunning one our of cement blocks. I build the pen in a corner of the yard. The pen is about 6 feet by 6 feet and can easily accommodate 2 dogs. More if I clean it every day instead of every 2-3 days. The fence is about 1.5 feet high and looks like a mini version of a corral, with corner posts and 2 boards for each side. On one side in a corner we left the bottom board out. In doing this we made it so small dogs, puppies, or senior dogs can go out this opening. Most others just choose to jump in and out once they are big enough. It is made of wood and takes us roughly 3-4 hours to build. To keep the bottom of the pen clean I like to put gravel down. The cost is roughly $25-$30 dollars to build if you have to buy the wood. We always just go to the dump and pick up some old wooden pallets and use those by dismantling them. So we save a lot of money that way. Once it is built, here is the basic schedule and instructions on how to train the dog or puppy to do this. I put all dogs and puppies on this schedule for the first week. Then I adjust it as needed per each dog. The purpose is because adults dogs are not always house trained when they get here and puppies needed to be house trained. This schedule helps me to learn their potty schedule in a controlled way. The purpose to there being so many crate times is to help find out their schedule and also for puppies to learn to control and extend their bladders with short periods of time. Also after the first week the schedule can be change as each puppy shows that they can handle longer periods. The playtime I would extend by 15-minute intervals. Each will also progress at different times and in different ways so I would keep track of the schedule that each is on. Puppies do take to the training faster then the adults. "''" 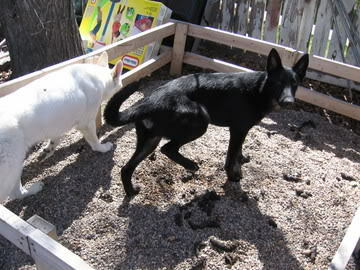 As for training them to go in the potty pen the first secret is once it is built clean up your yard and put any feces in the pen. Then spray down the lawn really well with a hose. You will end up using the crate a lot during this time. You will stop using it I promise. Sheena only uses her crate now when she wants too have a break. The door has been taken off of it. Daya never uses a crate any more at 3yrs old. Once the puppy or dog goes then the pup can have supervised free time till the scheduled crate time. In doing this I learn their potty schedule and they also learn to go when I want them to which is great. I can take Sheena out at 3pm and then if I suddenly have to go out I can take her back out 10 minutes later and she will go and then we can go where ever I need to. Since she was a service dog being able to leave the house with an empty bladder is a must. She has never had an accident in any business because of this schedule. As you can see your dog will be learning several different behaviours. First to alert you that they need to go out. Which means you won’t have to worry about forgetting to take the dog out. Two to go potty on command. With the command “Go Hurry” I could ensure that when Sheena was out for a long period of time working in public with me, I could take her to a proper potty area and have her go on command without having to wait. "''" You have to be consistent. For the first while you can't leave them alone in the yard. If you see them while playing start to sniff around or squat then clap your hands loudly and shout "NO". Take them immediately to the pen. And follow the procedure. If they don’t go then put them in their crate and so on. Don’t just let them back out. They will learn that great things happen when they use the pen. Don't get frustrated either. Some dogs can learn in a few days and some I have know to take as long as a month. I have known some adult dogs to be really stubborn and hold themselves for 10 hours before going. Since Sheena was started on the schedule the same day we got her she was house trained in 2 days and learned the concept of the potty pen in a week. "''" Now we don't even have to go outside with her. I just open the door, she runs to the pen, goes then runs back in. Same thing when she is playing outside. She will stop playing and run to the pen, without command, go and then go back to playing. Same with Daya and many other dogs I have owned and trained over the years. "''" I have used this technique with lots of rescued, abandoned, abused, adult, teenage dogs and puppies. And I have not once had this not work. But like I said some do take longer than others. Also one last thing. If they do have an accident in the yard immediately clean it up after putting them in their crate, and spray the spot down well with a hose. Don’t bother to punish the dog or puppy. You want them to think that going potty means good things not punishment ever. Now when it says on the schedule to take the puppy out of the crate, immediately put the leash and collar on so that you are in control the whole time. If it is a puppy I recommend you carry it to the pen. Start with taking the puppy or dog to the door you will be leaving though each time she is being taken out to go potty. This part about the bell is optional but with having kids distracting me I like having the dog be able to signal to me that they need to go. Have a nice sized ball bell tied to a rope and tied to the door. Take her paw and get her to hit the bell so it makes a sound. Only do this when you are taking her to go potty. In doing this she will later learn to hit the bell to let you know she needs to go outside to relieve herself. Now open the door and take her to the potty pen. Give the command for going potty every 30 seconds for five minutes; I like to use the term "Go Hurry". If she tries to leave the pen block her exit and use the leash to keep her in it. If the puppy goes then get very excited, praise and give her a piece of kibble or get her to play tug or toss a ball as a reward. It is very important that you get very excited every time she goes. If she doesn’t go then pick the puppy up and put it back in it's crate for 10 minutes. Then try again. Keep this up till the puppy goes. No punishment and lots of praise to help the puppy gain confidence.